Portland Fashion Week asked us to join their team and provide web and graphic support for their events. Their web and graphic presence was in complete disarray when we came on board so we were happy to perform an entire re-branding and bring them up to speed with current design trends. We started with the redesign of their logo and print collateral then we tackled their website. 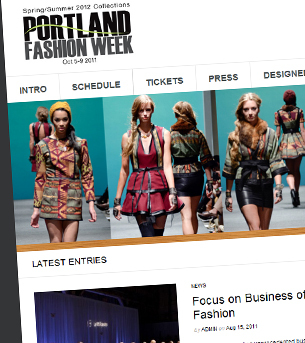 The website was built in such a way that the PFW interns could easily update it and as a result could provide timely content for the public. When we were finished all of the programs and print collateral for the event for the first time had a consistent theme and the event was catapulted into a new level of success. During and after the events our work was met with high praise from the fashion community. Since our expertise in the branding arena is vast as is our event planning experience we were able to consult PFW on many ways to streamline their events for the following years and achieve even greater success in the future. Our planning and event direction can also be seen in the subsequent FashioNXT events. We were brought on early in the planning stages of FashioNXT as a consultant and design lead and our ideas were quickly integrated into the core of that event as well.